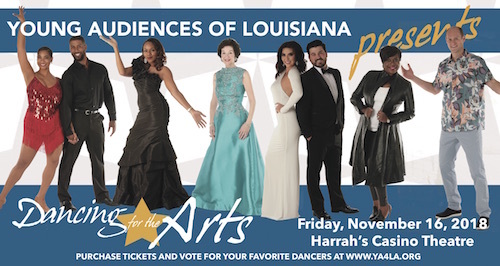 Inspired by ABC’s Dancing with the Stars, the 9th Annual Young Audiences Dancing for the Arts gala will feature local community leaders competing on the dance floor with professional dancers for the coveted People’s Choice Award. The gala will be held at Harrah’s Casino Theatre this Friday, Nov. 16 from 7 to 11 p.m., starting with a red carpet reception and cocktail hour. Festivities will also include a silent auction, open bar, fine fare, and entertainment. All proceeds from the gala will support Young Audiences’ after school, summer, and early learning arts education programs. All ticket levels include food, drinks, and live entertainment. Those who cannot attend are encouraged to vote for their favorite dancers online. Ticket prices start at $75. To purchase tickets or tables and/or vote or please visit ya4la.org. This year’s event is chaired by community leaders Stella Del Bianco, Gail Barnes McKenna, and Tyree C. Worthy with Anita Demps, Allison Kupperman, and Melissa Booth as Silent Auction Chairs. Star dancers include: Nadine Brown, Director Provider Affiliations at Peoples Health; Sandra Thompson Herman, philanthropist and community organizer; Austin Marks, attorney at Morris Bart, LLC; Christina Famularo Rodrigue and Tony Rodrigue; Brionne Stewart and Trent Marcelle, Young Audiences Charter School Lower School Principal and Field Engineer at Barriere Construction Company, respectively; and Tamara J. Wyre, Vice President, Senior Portfolio Manager at Hancock Whitney Bank. TV personality Camille Whitworth returns as Mistress of Ceremony along with a panel of celebrity judges that includes: Stephanie Burks, Vice President & Division Leader of Administration at RYCARS Construction, LLC; Mary Katherine Lonatro-Tusa,philanthropist; Kenny Lopez, WGNO-TV Reporter; and Steven Putt, Director of Marketing PR at Saks Fifth Avenue. Event sponsors include: Delta Airlines, Harrah’s New Orleans, Capital One, Landis Construction Co., LLC, Schiro-Del Bianco Enterprises, Inc., Entergy, IBERIABANK, Adams & Reese, LLP, and Crescent Sterling LTD.
Support YALA’s commitment to learning through the arts during the 9th Annual Dancing For The Arts gala by donating a silent auction item, becoming an event sponsor, purchasing tickets for the event, or voting for your favorite dancer. For more information or opportunities, please contact Jen Gick, Director of Development, at jeng@ya4la.org or 504.304.5196. Young Audiences of Louisiana was founded in 1962 with the mission to inspire, empower, and unite children and communities through education, arts, and culture. Over the last 55 years the organization has grown from presenting school performances of chamber music to our current position as the state’s largest provider of arts-integrated and afterschool programs. To learn more about our mission, please visit Young Audiences of Louisiana.